In a medium bowl, whisk together sesame oil, vinegar, honey and salt and pepper, to taste. Stir in sugar snap peas, radishes and green onion. Set aside. Heat oil in a large skillet to medium-high heat. Dry scallops with paper towel. Season both sides of the scallop with salt and pepper. Once oil is hot, place scallops in the pan. Cook until bottom is browned and crispy, about 2 minutes, then flip and cook for an additional 2 minutes. Remove from the pan and place on a paper towel. Add orange zest and juice to the hot pan, the whisk in brown sugar. Place ginger in the pan. Simmer until slightly thickened, then whisk in butter. Remove ginger. 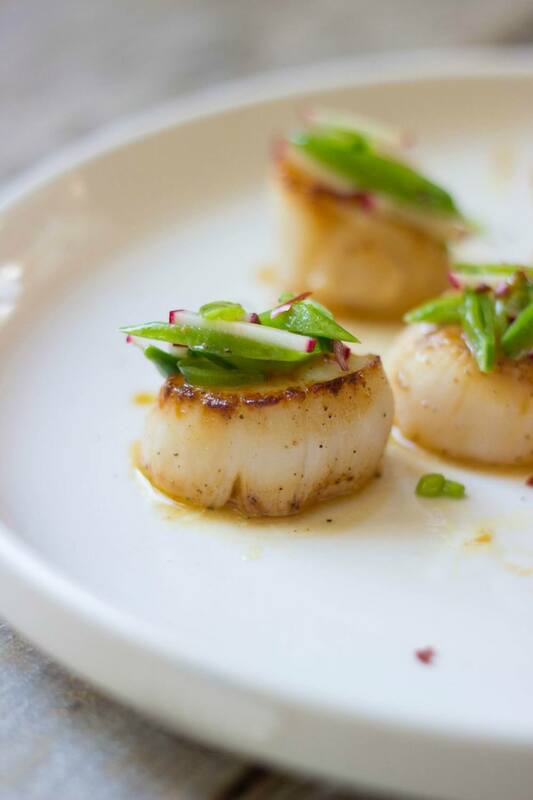 Spoon sauce over scallops and serve topped with sugar snap pea slaw.